Chuck and Joy Hanson invite you to stay in their charming 173-year old Mason House Inn Bed & Breakfast located in historic Bentonsport, Iowa. This antique hotel was built in 1846 by Mormon craftsmen coming from Nauvoo, Illinois, as a hotel for the steamboat travelers. 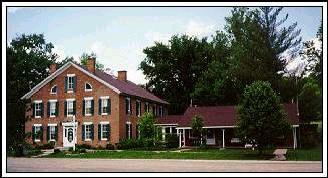 It has been used as a hospital three different times, and was also a station on the Underground Railroad. Nestled on the banks of the beautiful Des Moines River, Bentonsport is one of the Villages of Van Buren County that were among Southeast Iowa's very first settlements. A full country breakfast is served in the 40 foot dining room at the time of your choice. Please let Joy know if you have any dietary restrictions. She will be happy to adjust the menu accordingly. "There is a cookie jar in every bedroom." And, as some of our taller guests will attest, comfortable beds that are of adequate 21st Century size. We feature King, Queen, and Extra-long double beds. Some rooms also include a twin bed or two for children. Room 1 features a Tempur-Pedic Allurabed mattress with ergo and massage! And all rooms have free wireless internet access, just ask us for the password. In keeping with our 'antique' theme, there are no TVs or radios in the bedrooms to detract from the ambiance. (There is a TV in the Caboose Cottage because that is not antique themed.) Take a tour of our rooms to help you decide. 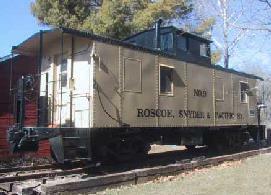 Our Caboose Cottage is in a real 1952 railroad caboose from the Roscoe, Snyder & Pacific Railway line from Texas. It features a queen-size bed, satellite TV with DVD player, free wireless internet access, a dining area, full kitchen and private bathroom with shower. Come to the Main house dining room for breakfast with the other guests. A great, fun place to stay for train enthusiasts of all ages. 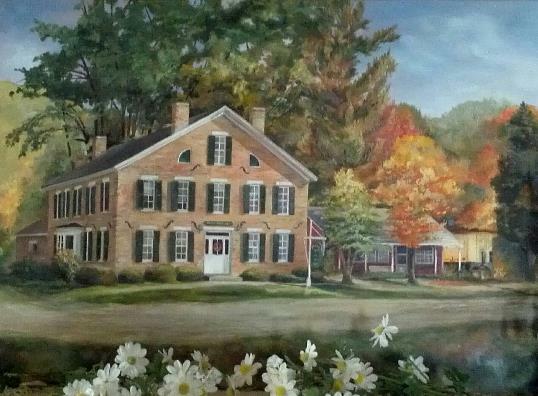 The Mason House Inn is an ideal location for retreats, seminars, reunions, honeymoons, wedding groups, church groups, Murder Mysteries, quilting retreats, book club retreats, weekend get-aways, and anytime you want to 'get away from it all'! We urge you to inquire and make your reservations early, as we have only nine rooms (each with its own private bath). We are OPEN ALL YEAR. 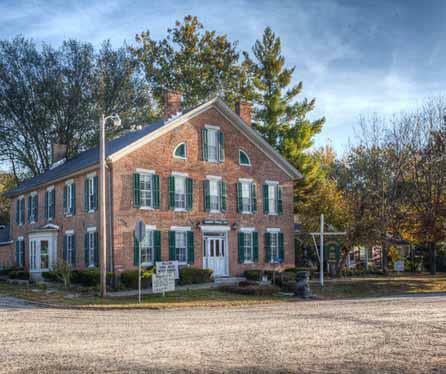 If you are looking for Southeast Iowa lodging, accommodations, or hotels, we urge you to consider our cozy Bed and Breakfast in friendly, historic Bentonsport, Iowa. Any IPTV discounts must be approved at the time of reservation and are good for Sunday - Thursday only. Payment with Cash or Check. No discounts with credit or debit cards. Discounts not given on festival weekends. *****We do have friendly cats on the premises. Please take this into consideration if you have allergies. We also have chickens for fresh eggs! How to find us? Please visit our Maps page or just call us for directions. Many GPS gizmos have us at the wrong location, or direct you to unpaved roads, so don't trust it. Please follow our maps. We are centrally located between Chicago, St. Louis, Omaha, Kansas City, and Minneapolis. All only a short trip away on Hwy 218 or Hwy 34 or Hwy 2.. Our near-by larger cities include Des Moines, Iowa City, Cedar Rapids, Burlington, Mt. Pleasant, Fairfield, Ottumwa, Kahoka, Ft. Madison, Keokuk, and Nauvoo. The closest airports are Cedar Rapids and Des Moines. *****For Reservations, please call Joy at 319-592-3133. We still believe in the personal touch and prefer to make our own reservations. We use no third party reservations sites because all our rooms are unique. We would rather help you choose the perfect room for you, rather than have a faceless third party choose any old one for you. Also, they have no idea what our real occupancy is and are perfectly happy to over book us and have you upset at us. And they charge you Their Fees and Taxes, which are much more than our State and Local tax (No hotel/motel tax here!). Some of these third party booking sites list us as being FULL, but that may not be true since they have no idea what our actual availability is. So please just call us directly. Thank you.